When Bill James started his pioneering work some three decades ago, he was consistently denied access to the scorecards. The Elias Bureau, baseball's official statisticians, had them, and they wouldn't share the information with an outsider for love or money. That attitude ultimately led James and others to start Project Scoresheet, which led to the creation of STATS Inc. and Baseball Info Systems, and, along other tangents, to Retrosheet and Baseball Reference. If you want play-by-play info from games gone by — what James sought to buy from Elias in the 1980s — it's on the web, and it's free. For a good while, there was more sophisticated baseball information available to the fans than the teams, or at least a good many of them, themselves took advantage of. That's past now. Let somebody start doing some innovative Pitch fx analysis and start posting the results on a website, and pretty soon a tech-savvy organization will call, offer the analyst a job — and order the site shut down. You work for us now. James himself works for the Red Sox, and he is limited in what he can share with the public as a result — and he was, after the struggle with Elias, outspoken about his desire for openness in baseball research. 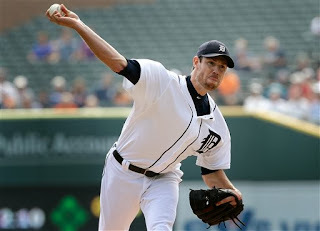 “They do it differently, Zimmermann with velocity, Fister with movement. But they get the same results,” Rizzo said. Average velocity off the bat. Boswell cites Fister's won-lost record out of habit, but that's not what gets Rizzo revved up. It's how hard batters hit the ball off Fister — and Rizzo has actual data to back it up. And it's not information available to the masses. Most — maybe all — teams have their own statistical systems to evaluate defense. We outsiders have access to such metrics as ultimate zone rating and plus-minus; the teams have that access too, plus their own analysis. We're back where we were when I started following baseball, when the people running the teams truly knew more than even the most sophisticated fans did. For a good part of my adult life, that hasn't necessarily been the case. As a Twins fan, I just hope this development isn't leaving my team behind. I have, truly, no idea if Terry Ryan and the people advising him know what the average velocity off the bat is for Ricky Nolasco, or even for Sam Deduno. I do know they'd be better off with the knowledge than without. hole in the palm. I think this one is Frank Frisch's. have a hole cut into the palm. Maranville advised the young Durocher to cut a hole in the palm of his glove; this, Maranville said, would give him a better feel for the ball. And Durocher did so, playing for years with his palm exposed. Then, Leo relates, as he was about to cut out the palm of a new glove, he asked himself why he was doing this — and opted instead to thin the leather instead of removing it all together. 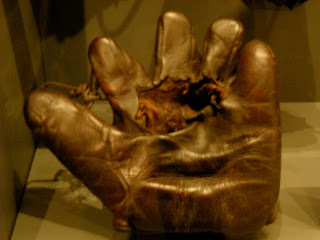 So ... now I'm looking at gloves on display in the Hall of Fame museum, and I start noticing a number of infielder gloves from that era with holes in the the palm. Frank Frisch, for example — Durocher's manager and double play partner on the Gas House Gang — his glove has a hole in the palm. Know whose displayed glove doesn't have a hole? Rabbit Maranville. Go figure. The sign over the door says: "The National Baseball Hall of Fame and Museum." And, indeed, if you pay attention, it's easy to tell the difference. The Hall of Fame, per se, is just that: A hall. It's a long gallery of plaques — we came up with a count of 240 — of the players, umpires and executives who have been formally enshrined. This is the place we mean when we talk about whether Jack Morris should be in the Hall of Fame. It's also pretty close to the last place visitors are supposed to get to. Enter the building, and you are quickly herded to the left for admission and off toward the museum. Which, as I explained in an earlier post, is an exhausting proposition. Rewarding, to be sure, but exhausting. On one of our tours of the museum, we encountered a man (wearing a Philadelphia Phillies cap) who was surprised to find Pete Rose memorabilia in the exhibits about the Big Red Machine dynasty of the mid '70s and again in the display about the Phillies of slightly later vintage. "I didn't think they let anything about him in here," he said. That illustrates, I think, the difference between the Hall of Fame and the museum. Rose's gambling transgressions have barred him from the Hall of Fame. They haven't kept him out of the museum. One cannot tell the story of baseball in the 1970s and '80s (and part of the '60s) without Rose, and he is well represented in the museum. The Philadelphia Phillies were, in the 1920s, '30s and '40s, the dregs of the National League. They played for much of that period in a dump known as "Baker Bowl", which was not merely cramped and uncomfortable but downright dangerous (seating sections twice collapsed during games, in 1903 and 1927). The combination of bad baseball and lousy accommodations did little to encourage attendance. The story goes that during one boring midsummer game the writers in the dilapidated press box at Baker Bowl started throwing water at each other. The water fell through the cracks in the wood floor into the seating area below. The Phillies owner burst into the press box to castigate the scribes. "Knock it off!" he ordered. "Don't you know there are paying customers sitting down there?" One of the writers lunged for his typewriter. "My god!" he bellowed. "What a story!" I have been to Cooperstown twice, at drastically different times of the year. The first time was Induction Weekend of 2001, when Kirby Puckett and Dave Winfield (and Hilton Smith and Bill Mazeroski) were inducted. The little village was packed with thousands of visitors; it wasn't easy to move about on Main Street or in the Hall of Fame building. 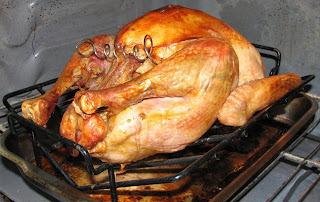 The second time was the week before Christmas. There were some visitors, but there was never a problem getting a table at lunch time at the Doubleday Cafe. Many of the memorabilia shops and restaurants that dominate Cooperstown's Main Street were closed — there's something odd about seeing a sign in a retailer's door that says Closed until after Christmas, but so it was. 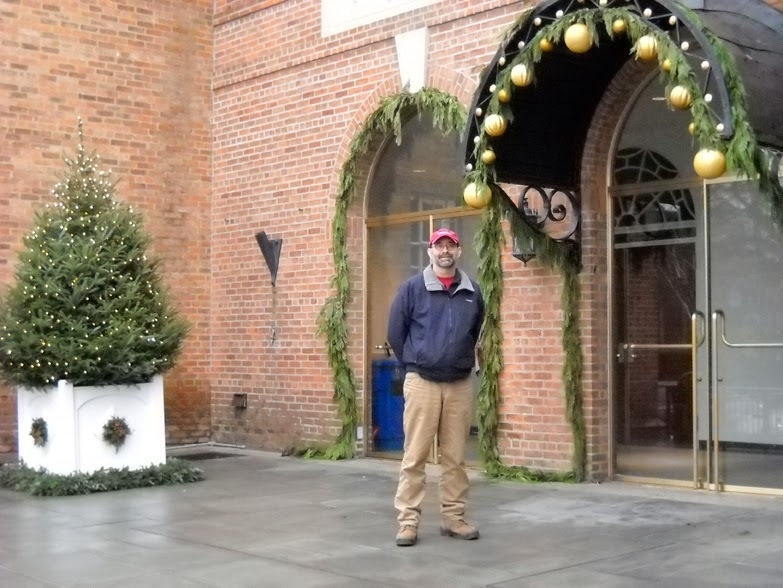 Winter is the offseason for Cooperstown's tourism for cause, of course. But to a large degree, I came away from this trip convinced that if one's motive is to absorb as much about the game of baseball as the Hall has to offer, the offseason is the time to go. Here's the thing: There's too much there to grasp in a day, or two days. My wife and I went to the Hall five days, and each day I noticed things that had eluded my attention previously. Yes, one can rush through the three floors of the museum — not to mention the plaque gallery — in a day, but understanding what's there is another matter. I found that after one floor, my brain was numbed. Go there in the summer, and the crush is on. Hundreds of people are trying to see the same stuff you are. Go in the winter, and you can dawdle and study without blocking somebody else's view of Honus Wagner's bat or Mariano Rivera's muddy spikes. You can take a lengthy pause at the broadcast exhibit and wait to hear Herb Carneal's call of the last out of the 1987 World Series (yes, it plays in rotation). There are drawbacks to going in the winter. We had vague plans to visit the research library and perhaps investigate the connection between Mankato and Deacon Phillippe, a pitcher who starred in the first NL-AL World Series. But the library operates on very limited hours in the winter (and even if it had been open, they prefer a couple weeks notice to line up the material). The support businesses around the Hall are limited. And, while we were on the whole fortunate with the weather during our visit (it was 55 degrees on Sunday), winter in the Catskills can be pretty heavy on the snow. The trip and its timing could have backfired. It didn't. And I got more out of this longer, leisurely visit that I did out of the more frenetic one a dozen years earlier. 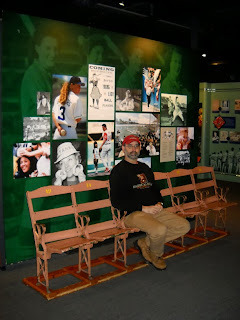 I was gone for the past week -- a holiday week in Cooperstown, actually, something I'll be posting about in coming days -- and in keeping the spirit of the venture I avoided actively blogging. Yes, there were fresh posts each day, but they were all pre-written and scheduled to be posted. I took note of the Ryan Doumit trade just before leaving town, and everything since was canned. Kurt Suzuki signed. When the Twins traded Doumit to Atlanta, it was pretty obvious that they were going to add a veteran catcher. The chatter about free-agent backstops, once A.J. Pierzynski and Jarrod Saltalamacchia signed elsewhere, was about John Buck and Suzuki. Of the two, I prefer Suzuki, although that's not saying a great deal. 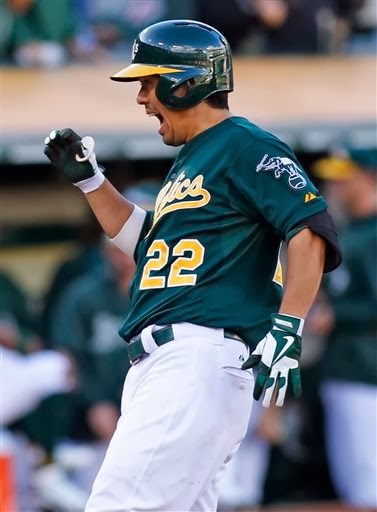 Suzuki is a 30-year-old catcher who was worked hard by the Oakland A's in his mid-20s and hasn't been an effective hitter since. At one point the A's hit him third quite a bit, although he wasn't a legit middle-of-the-order bat. It was akin to the Twins hittting Brian Dozier third in September this year; somebody has to fill that slot, and Dozier/Suzuki were the best of a bad bunch of options. Suzuki is essentially a generic catcher. 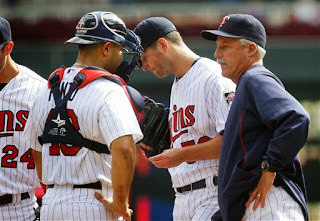 He'll start if the Twins decide Josmil Pinto needs more minor league time, or if Pinto's troublesome shoulder isn't up to the task (Terry Ryan downplays the shoulder issue, but it has taken Pinto out of winter ball); he'll back up Pinto if the kid starts. I hope it's the latter role. Mike Pelfrey's signing also became official. I've said my piece on Pelfrey a few times already. I'm at a state of grudging acceptance and moving on. Darin Mastroianni outrighted. 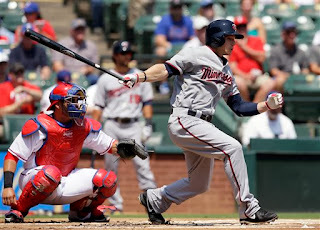 The Twins had opened a 40-man roster spot with the Doumit trade, so they needed another to execute the two signings. Mastroianni lost his spot. The outfielder remains in the organization -- he wasn't eligible to declare free agency -- and I think he still has a legitimate chance to make the club out of spring training. Not being on the 40 already is a bit of a hurdle, but not as big as proving that his 2013 ankle injury didn't steal his most important tool, his speed. 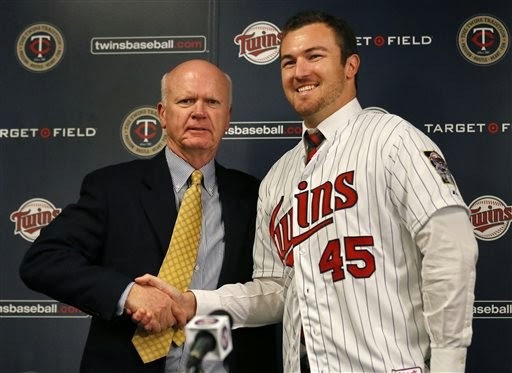 This wasn't a Twins move, but Liam Hendriks -- who the Twins lost on waivers to the Cubs in an earlier roster-opening move -- was waived by the Cubs and claimed by Baltimore. Odd, this, because Baltimore had to pass on Hendriks for him be to claimed by the Cubs (when the Twins put a player on waivers, American League teams have the priority). So the Orioles passed on him when the Twins waived him but claimed him when the Cubs waived him. Scott Diamond had a difficult 2013. The 2014 Bill James Handbook contains a nine-page essay by the sabermetric pioneer that digs into the "Pitcher Analysis" data. This is the segment, referred to frequently in recent weeks during posts about Ricky Nolasco and Phil Hughes, that records, pitcher by pitcher, how many strikes, how many balls, how many ground balls he got, how many swinging strikes, yada yada yada. 3. How important is Ground Ball Rate to success as a pitcher? James being James, he defends this assertion for a couple of pages. I'm not going to quote the whole thing, but his interpretation of the data makes sense. And in 2013, at least, the two groups of pitchers who had the lowest ground ball rates were the two most effective groups. James' basic point: It's more important for a pitcher to get strikeouts than ground balls. I believe that to be true. Yet I also believe that a ground ball pitcher — an extreme ground ball pitcher — can be effective. Diamond was that extreme ground ball pitcher in 2012. He wasn't in 2013. According to the Handbook: Diamond, in 2013, faced 576 batters. He got 227 ground balls (39.4 percent), 154 fly balls (26.7 percent) and 103 line drives (17.8 percent). This appears to be on the high end of ground ball rates — the chart only gives bulk numbers — and it didn't result in a good season for Diamond. In 2012, Diamond had 714 BF, 311 GB (43.5 percent), 149 FB (20.1 percent), 122 LD (17.1 percent). The difference is obvious. Fly ball rates up sharply, ground ball rates down sharply, line drive rate up a bit. What's more troublesome for the lefty: he threw just 62 percent strikes (not real high) in 2013 and had just 10 percent swinging strikes (extremely low). The 2013 Handbook doesn't give the same data for the 2012 season, so I can't directly compare Diamond's strike-throwing from year to year. But given the rise in his walk rate and the decline in his strikeout rate, it's a safe bet that he wasn't throwing strikes at the same rate in 2013. None of this is really new information, of course. Diamond's 2012 success was based on doing the things he does well — throw strikes, get ground balls — extremely well, top-of-the-league well. In 2013, he declined in those things, and that won't work for him. He doesn't have a swing-and-miss pitch. He has to work around that, and James' essay, without ever mentioning Diamond, tells us why that's not easily done. there's baseball to be played? 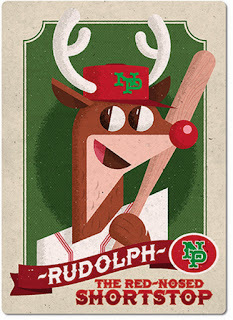 In honor of the holiday, here is a link to the official Baseball Reference page of Rudolph the Red Nosed Shortstop. I particularly like the list of most similar players. I find this somewhat amusing: Nick Punto, derided by the stat-savvy on the blogosphere during his years getting regular playing time with the Twins, is now, in the bounce-around phase of his career, making the rounds of the most sabermetrically oriented organizations. First, he signed with St. Louis. Then with Boston. Now, with an intervening trade to Los Angeles, he's signed with Oakland. To be sure, he hasn't gotten the at-bats with these teams that he did with the Twins -- fewer than 700 plate appearances the past three years combined. But he did play in 116 games with the Dodgers last year, filling in around the infield, and in 2011, he was a lineup fixture in the NLCS and World Series as the Cardinals won it all. Punto's 36 now, and he will never be an offensive force. But he was always a better player than his detractors recognized, and the willingness of some of the sharpest front offices to find space for him on their rosters even in his decline phase speaks to that. he was an ineffective base stealer. As a team, the 2013 Twins ran the bases well. They stole bases terribly. Those assertions are supported by the baserunning stats in the 2014 Bill James Handbook. Baseball Info Systems credits the Twins with a gain of 44 bases on baserunning. The formula, which excludes steals, encompasses extra bases on hits and fly balls and subtracts for baserunning outs. The Twins' 44 bases was third highest in the majors (behind only Tampa Bay and Oakland). But basestealing? That was another matter. BIS has the Twins a -14 on steals. Only Arizona fared worse than Minnesota at stealing. A fair chunk of Twins deficit is likely charged to Alex Presley, who came to the Twins from Pittsburgh in the Justin Morneau trade. Presley played center and led off pretty much every day in September, and he was 1-for-4 in steal attempts. He was 0-for-1 with the Pirates, and BIS has him as a -7 as a basestealer. As a long-ago sportswriter quipped about a Brooklyn Dodger who similarly couldn't steal bases: There was larceny in his heart, but his feet were honest. Were I running the Twins, I would be planning on a Presley-Darin Mastroianni platoon in center to open 2014. But I would be very wary of trying to steal bases, at least with Presley. Presley seems to have the Greg Gagne basestealing glitch. Gagne, the Twins shortstop for their two World Series teams, was a fast man and a good baserunner, but he was simply unable to read pitchers to get the jump to steal. We frequently hear coaches assert that so-and-so will be a good basestealer when he learns to read pitchers, but it really appears to be something that can't be taught. A reporter asked Rickey Henderson about Ken Caminiti's claim that 50 percent of major leaguers were using steroids. Henderson replied, "Well, Rickey isn't one of them, so that's 49 percent right there." If Joe Mauer's swinging, it's probably not at the first pitch. No qualifying hitter in either league (minimum of 502 plate appearances) swung at the first pitch less often than Joe Mauer, 6.8 percent. The only surprise in that to most Twins fans, I suppose, is that Mauer took a hack at that many first pitches. But the second lowest percentage in MLB was Brian Dozier, who went for the first pitch just 8.6 percent of the time. 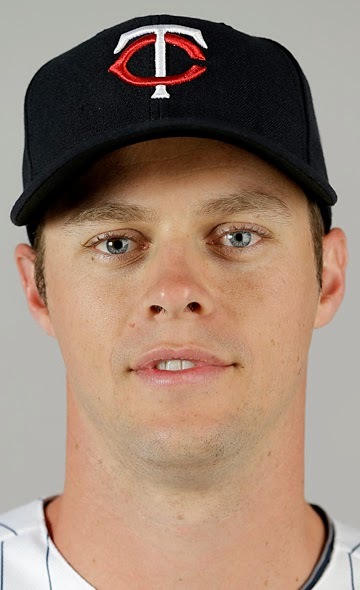 Justin Morneau, on the other hand, took a cut at the first offering 34.9 percent of the time, the seventh highest rate in the American League. (The AL leader was Miguel Cabrera, 39.7 percent, and the MLB leader was another former Twins player, Carlos Gomez of Milwaukee, at 49.5 percent). Is there some sort of meaning to this? The leaderboards contain outstanding hitters, or at least hitters having outstanding seasons, in both directions. Among the 10 AL regulars least likely to swing at the first pitch, besides Mauer, are Mike Trout (12 percent) and Dustin Pedroia (9.8 percent), and Shane Victorino (10.5 percent. Among the 10 AL regulars most likely to swing, besides Cabrera, are Chris Davis (34.7 percent) and Adam Jones (37.6 percent). There's nothing here to point to as evidence that one should, or shouldn't, avoid the first offering. Here's another one that may not surprise Twins fans: Oswaldo Arcia swung and missed at 32.4 percent of the pitches he saw. That's the fourth highest rate among AL players who saw at least 1,500 pitches. Arcia is sandwiched on that list between Mike Napoli, who hit .259/.360/.482 for the Red Sox, and Chris Davis, who bopped 53 homers for Baltimore, so this is hardly a fatal flaw. But it was certainly a factor in Arcia's yo-yoing back and forth between the Twins and Rochester. Theoretically, Mike Pelfrey and Kyle Gibson are similar pitchers: Tall (Pelfrey is listed at 6-7, Gibson at 6-6) right-handed, first round draft picks out of midwestern colleges, Tommy John surgery survivors. They're even fairly close in age (Gibson is 26, Pelfrey turns 30 next month). And, perhaps most significantly, they are both oriented to a high-velocity sinker and lack a swing-and-miss breaking ball. They're geared to ground balls rather than strikeouts. Pelfrey's return, added to the signing of Ricky Nolasco and Phil Hughes and the continuing presence of Kevin Correia, appears to push Gibson into a multi-pitcher scrum for the fifth rotation spot. Among the other candidates: Scott Diamond, Sam Deduno and Andrew Albers. Since Gibson has an option left, and Diamond and Deduno do not, Gibson may be a decided underdog in that competition. The question remains: Is Pelfrey really a better bet than Gibson? Let's compare the two with the help of the 2014 Bill James Handbook. Pelfrey's fastball in 2014 averaged 92.4 mph; Gibson, 92.1. Pelfrey threw his fastball on 73 percent of his pitches. Other pitches: 10 percent sliders, 9 percent splitters, 8 percent curves. Pelfrey's 680 batters faced hit 222 grounders (32.4 percent); Gibson's 238 major league hitters generated 92 grounders (38.6 percent). Pelfrey threw strikes on 61 percent of his pitches, Gibson just 59 percent. Neither percentage is good. It leads to too many deep counts and too many walks. The wild card here, of course, is that 2013 was, for both, the first full season after their respective ligament replacement surgery. But it has to be said: Pelfrey's "leading indicator" stats were in line with what he did before his injury. As far as I'm concerned, Pelfrey and Gibson are the same pitcher. It doesn't make a lot of sense to pay one $5 million more to block the other. the outfield, catching and DH. 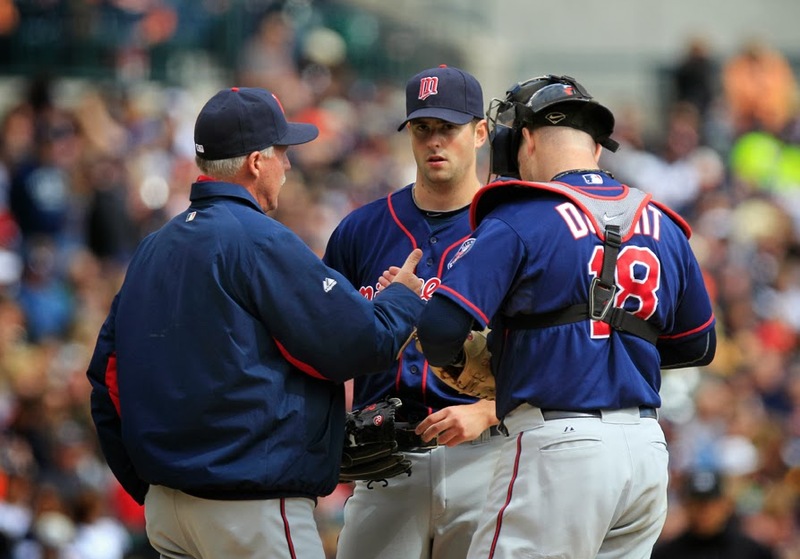 The Twins needed to open a spot on the 40-man roster for Mike Pelfrey. They did so Wednesday by trading Ryan Doumit to Atlanta for minor league lefty Sean Gilmartin. Gilmartin was a late-first round pick out of college by the Braves in 2011. He's reached Triple A already, but has been unimpressive there. Of particular interest to the Twins, besides his left-handedness and the possibility that he might still justify his draft status, is that he doesn't have to be on the 40. I had surmised earlier in the offseason that Doumit wasn't a significant part of the Twins catching plans post-Mauer. Moving him clears some of the corner outfield/DH clutter. It also leaves the Twins with three catchers on the 40: Eric Fryer, Chris Herrmann and Josmil Pinto. This may wind up being addition by subtraction; I assume the Braves had written off Gilmartin as a significant piece of their future and figured Doumit might be of immediate help. For the Twins, the roster spot may well be the point behind this transaction. brief tenure as hitting coach. Kansas City, long the weakest outfit in the generally weak American League Central, rose up to an 86-76 mark in 2013. They'd been down so long that that record felt, said general manager Dayton Moore, like winning the World Series. Such irrational exuberance soon wears off. And the Royals — who last made the playoffs in 1985, a season in which they did indeed win the World Series — are going for it hard in 2014. K.C. had a very young lineup last season. The oldest regular listed on their Baseball Reference page was 29. They did have the 39-year-old Miguel Tejada holding down second base for a few weeks until he got nailed for PED use, but the lineup was basically the fruits of what was regarded a few years ago as the most loaded farm system ever. Which is not to say it was a good lineup, at least at the plate. The Royals were 11th in the AL in runs scored. It was a very good defensive team, but offense was an issue. The Royals have acted on those problems. 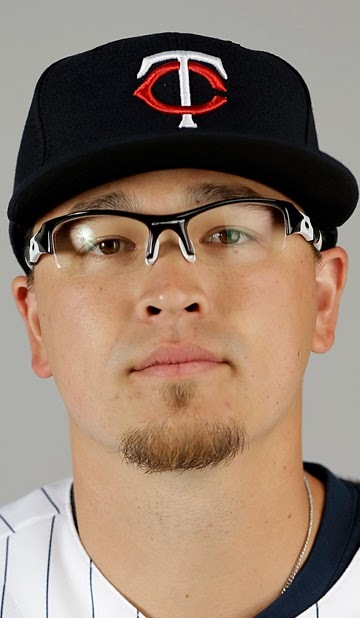 They traded a spare arm (lefty Will Smith) to Milwaukee for right fielder Norichika Aoki, who has a rare profile for a Royal: He doesn't strike out, and he draws walks. Aoki fits the defensive skill mode of the team, and he gives them a legitimate leadoff man. And they plugged the second base hole by outbidding the New York Yankees (!) for Tigers refugee Omar Infante. 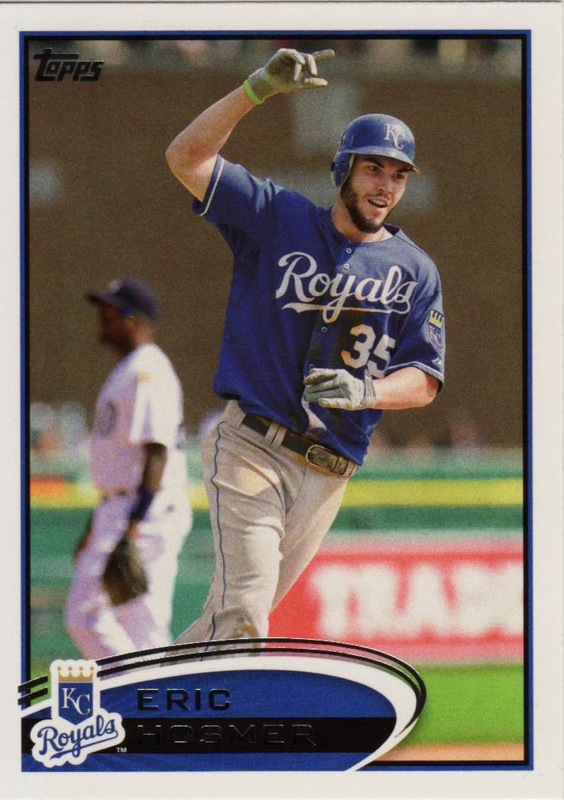 Infante hit .315 for Detroit last season, working in the bottom of the lineup; the Royals appear likely to put Aoki and Infante at the top, to set the table for Eric Hosmer, Billy Butler and Alex Gordon. I'd put Gordon second rather than fifth, but the fact remains: The Royals have improved the offense without damaging the defense. I'm not as high on their pitching outlook. The 2013 rotation put a lot of work on three arms. James Shields led the AL in innings, Jeremy Guthrie was 10th, and Ervin Santana was less than an inning behind Guthrie. 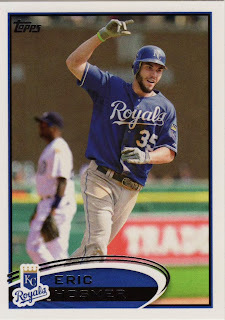 Shields is still around (last year of his contract, which is part of why the Royals figure to be all-in for 2014). Guthrie, 35 in April, is coming off arguably his career year; while he's been markedly better in Kansas City than he has been elsewhere, it's easier to see him falling off than repeating or improving. And Santana is a free agent, with the Royals appearing content to let him go elsewhere and pocket the draft pick compensation. Junkballing lefty Bruce Chen, who wormed his way into 15 starts (and a 3.27 ERA) is also a free agent. Between the two of them, K.C. is losing 332 innings of 3.25 ball. That won't be easily replaced. They signed journeyman lefty Jason Vargas to a four-year deal; he's unlikely to match Santana's 2013 in either workload or effectiveness. Kansas City is really counting on Danny Duffy, who returned from Tommy John surgery to make five starts in August and September with a 1.85 ERA. He wasn't really as good as the ERA suggests, but he is talented. More than Vargas, he's the one the Royals need to have fill Santana's role in the rotation. I'm not sure he's durable enough. in the World Baseball Classic. For Twins fans, it perhaps got lost in all the signings of free agent pitchers, but former franchise cornerstone Justin Morneau has signed with the Colorado Rockies. When the Twins traded Morneau to Pittsburgh, I figured there was a good chance he'd return to Minnesota. But then Joe Mauer's concussion recovery dragged on, and Morneau showed almost no power with the Pirates, and the likelihood dwindled. When the Twins announced that Mauer would abandon catching, it was obvious that Morneau was not coming through that door. And I'm fine with that. The former MVP turns 33 in May, and he has not been the same hitter since the notorious concussion that cut off what was shaping up to be a career season in 2010. Coors Field, the extremely hitter-friendly yard in Denver, may well recharge Morneau's numbers, but realistically, he's on the decline. Sentimentally, Twins fans will miss Morneau. But there really wasn't a place for him on this rebuilding squad. He is no longer potent enough a hitter to force a team to make room for him. Morneau's new contract reflects his diminished status: Two years, $12.5 million. Not terrible money, but he got $14 million last season. His pay has been more than halved. So now Morneau, who was wearing 33 with the Twins in part to honor fellow British Columbian Larry Walker, will play for the team Walker is most identified with. The Rockies have not officially retired Walker's 33, although that is a possibility. 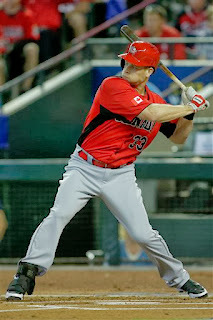 But I imagine Morneau will get to wear 33 for the Rox. And he'll be reunited with Michael Cuddyer, another former mainstay of the Minnesota lineup and the defending National League batting champ. (Coors Field, remember?) Another former Twin on the Rockies roster is LaTroy Hawkins, although there wasn't a lot of overlap between the Hawk and Morneau (a part of 2003). Liam Hendriks, dropped from the Twins' 40-man roster to make room for Phil Hughes, was claimed on waivers last week by the Chicago Cubs. It figured that the Twins would give up on him this winter. It also figured that somebody would claim Hendriks, who had some success in the minors (although he struggled in Triple A last year). I'm made my "Rule of 30" argument often enough about him that there's no point in repeating it. Hendriks is not a good bet to become an ace. I still think he can become an effective major league starter. The Twins demanded immediate success, or at least more than they got. Now somebody else will get to see if he's learned something from his struggles so far. Ron Coomer is also going to the Cubs. The Chicago native is to be their new radio analyst, sidekick to play-by-play man Pat Hughes. Keith Moreland had held the job for three years following the death of Ron Santo. I was never that impressed with Coomer's "insights" on the Twins TV broadcasts, but somebody obviously thinks he has something to offer the audience. Miguel Sano had his sprained elbow examined last week in Fort Myers, and the uberprospect has been cleared to resume throwing. A good sign, since his throwing arm is probably his second best tool (behind his power) and a big reason the Twins have stuck to the notion of playing him at third base. Terry Ryan repeatedly professed last week to being unconcerned about Josmil Pinto's throwing shoulder, but the catching prospect is now done with winter ball after about three weeks of not catching. A few months of Pinto not playing, in and of itself, does not disturb me. He and Sano and a few other Latin prospects might benefit from some time off from the game. But the shoulder was an issue during the summer, and I don't know why it wouldn't be an issue next year too. Toward the end of the 1942 season, when the Cardinals were closing in on us, this guy got a chorus girl and sent her to Philadelphia, where the Cardinals were playing while we were battling Cincinnati in Brooklyn. There was hardly no way the the Phillies could beat the Cardinals, especially when one of their aces was pitching. So this girl was told to get a date with one of the Cardinal pitchers the night before he was going to pitch, and she did. Next day he shut the Phillies out on two hits. When the girl came back, she was told she'd done a lousy job. "A lousy job! He drank two quarts of liquor and I guarantee he didn't sleep a wink all night." The Cardinals were coming to Brooklyn next, and the girl was given another chance. The pitcher was due to pitch the second game, and she made a date with him. She called in the morning and said she had been with him all night and she was dead tired and didn't see how he could be good for anything that day. But he shut us out on three hits and beat us 2-0. That looked like pretty good medicine for a pitcher, and I asked why they didn't try it out on me. Mike Pelfrey and the Twins have reportedly come to terms on a two-year deal, pending a physical. Had this come before the the Twins landed Ricky Nolasco and Phil Hughes, I would have agreed. Now, not so much. The money involved -- $11 million guaranteed plus incentives -- means Pelfrey ranks ahead of his fellow unimpressive holdovers from 2013.
? -- someone from the Scott Diamond / Sam Deduno / Kyle Gibson / Vance Worley group. Somebody on Twitter said this gives the team depth. Well, only until the season starts. Diamond, Deduno and Worley are all out of options. They'd have to clear waivers to be sent to Rochester. In truth, I'd rather have Pelfrey than Correia. There's a good chance that Pelfrey will be better in 2014 (another year removed from his elbow reconstruction, and his underlying stats were better than his actual results) and Correia was about as effective as he can be. But I'd rather see Gibson, Deduno and/or Diamond given a chance than either. Maybe -- maybe -- the Twins figure they can trade Correia. Meanwhile, the Twins supposedly are still pursuing Bronson Arroyo and/or Matt Garza, either of whom would fit ahead of Hughes in that rotation. 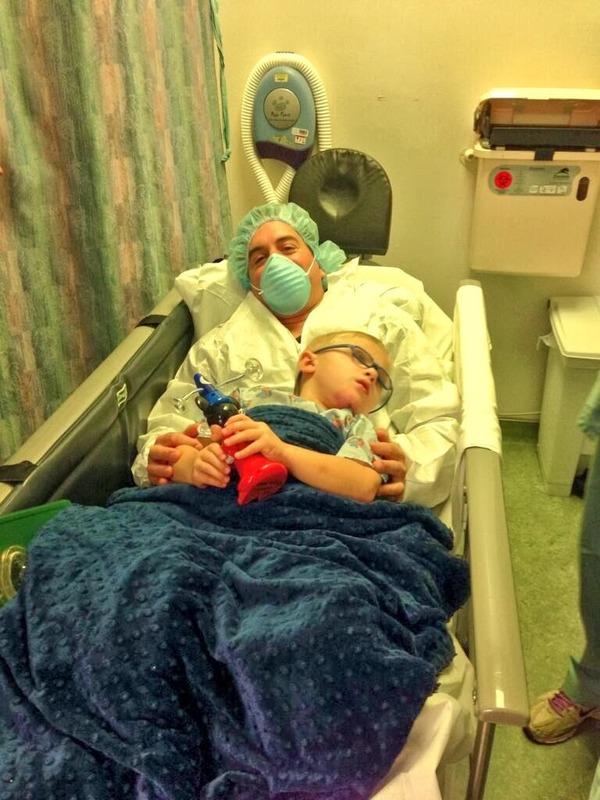 Jason Kubel: He's back, more or less, with the Twins. 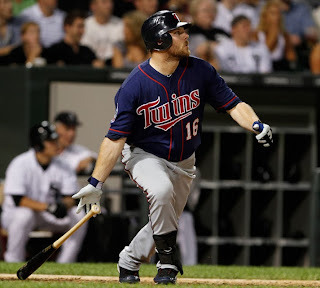 The Twins on Friday signed old friend Jason Kubel to a minor-league deal. It's a move that doesn't make sense to me on either end. The Twins have plenty of minimal defense corner outfielders already: Josh Willingham, Ryan Doumit, Oswaldo Arcia, Chris Parmelee. And, granted, Kubel had a miserable 2012 (.216/.292/.317), split between Arizona and Cleveland. But was his market really so limited that he had to settle for a minor league contract in a hitting environment (Target Field) he was known to have disliked before he left as a free agent? Kubel turns 32 in May, and it's certainly plausible that he can bounce back as a hitter. It's also likely that his best years are behind him -- which is also true of Willingham and Doumit as well. All three are on the wrong side of 30. If Kubel couldn't find a major league roster spot -- and he didn't -- that suggests a very weak trade market for Willingham and Doumit. My real fear is that Kubel will become an excuse for the Twins to bat Arcia around like a ping pong ball. I don't want to see another year in which the kid strikes out three times on Wednesday, sits Thursday and Friday, pinch hits on Saturday and goes down to Rochester on Sunday. I want Arcia hitting cleanup on a regular basis. I want to see some patience with him. There's a future in Arcia. There's a past in Kubel, Willingham and Doumit. Embrace the future. Thursday was the annual Rule 5 draft, when major league teams pick through the players their rivals deemed unworthy of protecting on the 40-man roster. I doubt that there is a team as devoted to exploiting Rule 5 as the Twins. Rule 5 provided Shane Mack, a key outfielder on the 1991 World Series champion team. It provided Johan Santana, who became the best pitcher in baseball for a few years. More recently, and despite a tightening of the rules that meant less talent was being exposed to the draft, Rule 5 brought the Twins pitchers Scott Diamond and Ryan Pressly. This year, for the first time in memory, the Twins skipped Rule 5, or at least the major league portion of it. In effect, they determined that there was nobody available in the field of potential picks who figured to be more valuable than the least player on the 40-man roster. Which is certainly possible, even with a number of replacement-level players on the 40. The Twins didn't lose anybody in the major league portion of the draft either. They did make two selections, and lost two players, in the minor league portion. I won't get into those picks; the only minor league Rule 5 guy I know of who so much as reached the majors for the Twins was Brian Buscher, who had two partial seasons at third base in 2008-09. Figure these guys as organization depth. If they emerge as something more, great. played to the level of his 1970 half-season. The specifics of the rule hasn't been written yet, nor has the general concept been endorsed by the players union, but baseball is about to ban home plate collisions. I have mixed emotions about this. Some highly memorable moments watching the Twins have involved home plate collisions: Kirby Puckett plowing over Terry Steinbach (Steinback held onto the ball). Dan Gladden putting Greg Olson upside down in Game One of the 1991 World Series (Olson held onto the ball). Torii Hunter blowing up the White Sox' Jamie Burke in 2004 (Burke did not get the out). 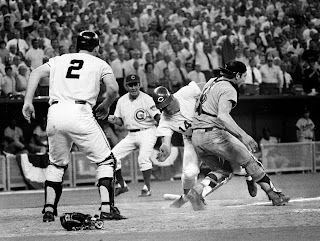 One not involving the Twins that sticks in my mind: pitcher Norm Charlton running over Mike Scoscia, the master of blocking the plate. 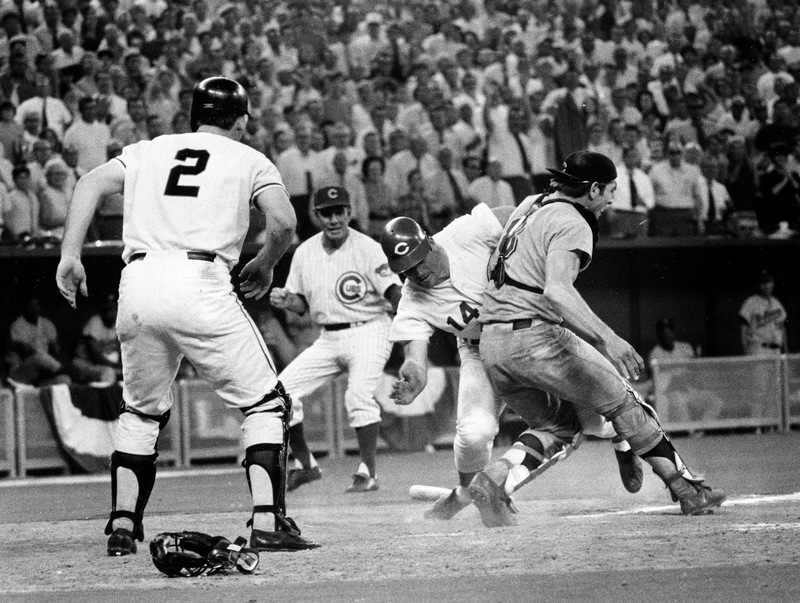 And, of course, the Pete Rose-Ray Fosse play, shown above. It happened in the first All-Star game I actually watched on TV. It was sort of a seminal moment for me: this is how the big boys play baseball. And yet, it is an undeniably dangerous play, for both the baserunner and the catcher. Denard Span's concussion in 2011 came from a play at the plate. The profit-loss equation has long encouraged catchers to block the plate. We got a dose of the obstruction rule during the World Series. What's the (official) penalty for a catcher who blocks the plate before securing the ball? Runner scores. What happens if catcher doesn't block the plate before getting the ball? Runner scores. Might as well block the plate. For years umpires let catchers obstruct baserunners. And, to be sure, some baserunners ran over catchers who weren't fully blocking the plate -- in part because catchers were adept at getting the shin guard into position to keep the runner from sliding home. Now all that's supposed to end. We'll see. 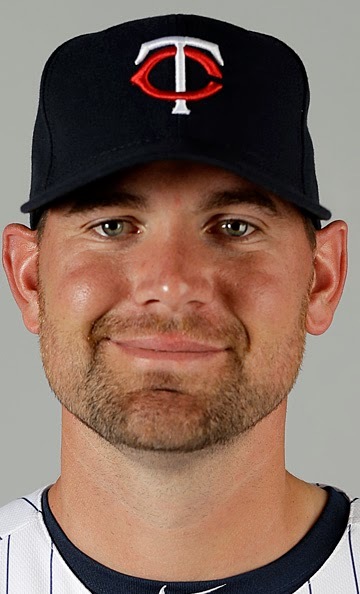 Mike Pelfrey: Will he return or move on? Another outwardly slow day for The Twins at the Winter Meetings. I should perhaps note here that I'm not actually at the Winter Meetings. I'm freezing in Mankato and reacting to the reports from the reporters who are in Orlando. But if' the Twitter feeds are any indication -- Mike Bernadino of the Pioneer Press was comparing Chapel Hill, N.C., and Columbia, Mo, as college towns for a while Tuesday-- it's been slow. Part of what's going on, the Twins are willing to admit, is waiting for Mike Pelfrey to make a decision. The idea of bringing Pelfrey back probably does not delight many fans. Pelfrey was part of the problem in 2013: 5-13, 5.19 ERA, just 152.2 innings in 28 starts, less than six innings a start. Of course, it was his first season back from Tommy John surgery, and he probably wasn't really ready to pitch in the majors as soon as he did. Still, even before he popped his elbow ligament while with the Mets, he was a low-strikeout guy with indifferent control who relied on getting ground balls. It's who he is. Pelfrey at his best — the Pelfrey of 2008 or 2010 — could be a third or fourth starter for a playoff team. But he's nobody's ace. the Twins gave him three years at $8 million. Of course, there are other issues involved here. Pelfrey averaged 3.1 walks and 6.0 strikeouts per nine innings; Hughes walked 2.6 per nine and whiffed 7.5. Pelfrey, as noted in a previous post, threw strikes on 61 percent of his pitches; Hughes threw strikes on 67 percent. And, of course, Hughes did his work with Yankee Stadium as his home office, while Pelfrey had the more forgiving Target Field. The results were similar, but Hughes's process was better. Of the two, Hughes is the better bet to post improved numbers going forward. The Twins are justified in valuing him above Pelfrey. selected Monday for induction into the Hall of Fame. The Twins -- and pretty much everybody else -- had a quiet first day of the Winter Meetings in Orlando, Fla. The Twins have not ruled out surgery for Miguel Sano, whose planned stint in the Dominican Winter League was cut off just as it began with a sprained elbow. The possibility of Tommy John surgery for the megaprospect -- and right now that's all it is, a possibility -- started a mini-flurry of speculation about making the Joe Mauer position shift to third base rather than first. I don't think that's happening. 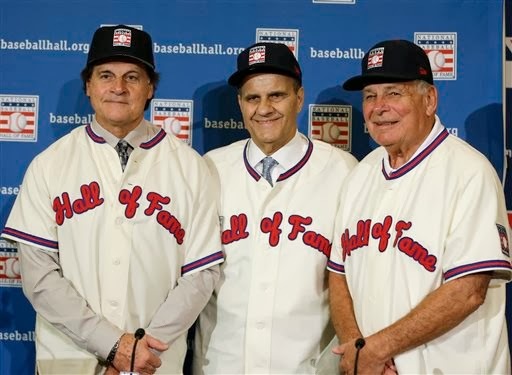 The biggest news overall was the Veterans Committee electing Bobby Cox, Tony LaRussa and Joe Torre to the Hall of Fame as managers. Or maybe the biggest news was the Veterans Committee bypassing Marvin Miller (again) and George Steinbrenner. Cox, LaRussa and Torre were obvious picks. Miller, in my opinion, should have been in long ago. Steinbrenner, as far as I'm concerned, can wait an eternity. I wrote this when he died, and my opinion has not softened with time. We Twins fans think Terry Ryan's been busy this offseason, signing two new starting pitchers. Ryan's got nothing on his Detroit counterpart, Dave Dombrowski. Created a spot in the rotation by trading a very good starter. It's a rather stunning makeover for a three-time division champ, albeit one that hasn't really met its expectations during the regular seasons. I wrote at some length last month about the infield revamp; the only new development there is that Dombrowski has now explicitly said that Miguel Cabrera is moving to first base, with Nick Castellanos at third base. The new stuff revolves around the mound. Begin at the end. 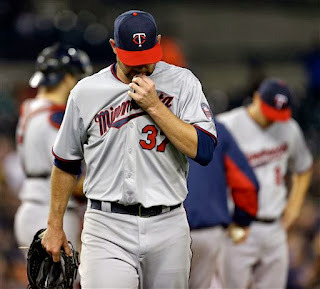 Erstwhile Twin Joe Nathan, now 39, got a two-year deal (option for a third year) to close. The Tigers had issues in the back end of the bullpen the past two seasons, and rookie manager Brad Ausmus (assuming Nathan doesn't decline) won't have to do the juggling act Leyland did. Joaquin Benoit, who finished 2013 as the Tigers closer, is a free agent, and Dombrowski has said he expects Benoit to sign elsewhere as a closer. Drew Smyly, who went 6-0, 2.37 with two saves and 22 holds in relief last season, will move to the rotation. 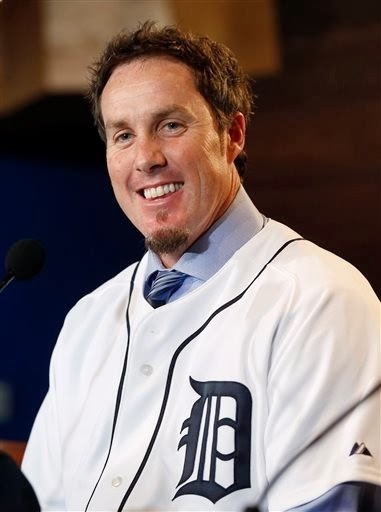 I had expected the lefty to take a starting job last spring; it will happen in 2014 instead. And he won't be dislodging Rick Porcello, but Doug Fister. 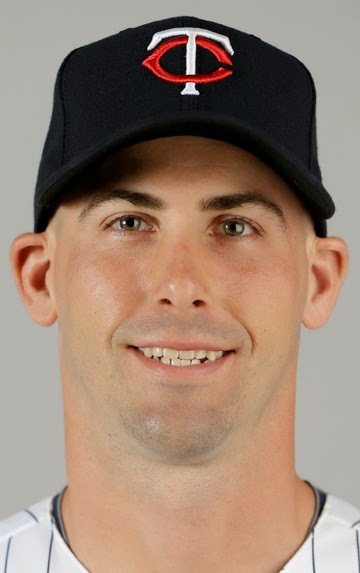 Fister was traded to Washington for a package of utility man Steve Lombardozzi (son of the same-named second baseman of the 1987 Twins) and left-handed pitching prospects Robbie Ray and Ian Krol. It's an underwhelming return for Fister, who had quietly become one of the top 20 or so starters in baseball. Adding left-handed pitching to a thinning farm system. Dombrowski achieved those things. That the general consensus around the game is that he could have made a better deal probably doesn't cost him any sleep. The "better deals" presumably didn't meet his targeted desires. The Tigers aren't in a talent-accumulating position. They're in a talent-arranging position. They're out to win now, not to build a base to win from. Ryan has typically been the master of winter patience, waiting until he has the last open seat in the game of player musical chairs. This time he's stuck rather quickly. He still has something in the neighborhood of $15 million in 2014 budget space and a team with holes. What might we look for from the Twins at the Winter Meetings and beyond? A roster opening move. The Twins have the fifth pick in the Rule 5 draft, but at this point no way to use it, as the 40-man roster is full. The Twins take Rule 5 seriously. They almost always select somebody in Rule 5, and are more likely than probably any organization in baseball to find a way to keep that selection, so it's hard to imagine Ryan and Co. sitting it out this year. But first they have to clear a spot on the 40. Catcher. Ryan indicated this week, after A.J. Pierzynski and Jarrod Saltalamacchia found new employers, that the Twins were willing to move ahead with Josmil Pinto as Plan A behind the dish for 2014. I suspect it's a case of willing but not eager. The options are thinning out, however. Starting pitcher. The Twins have added two starters; they're open to adding a third, but they don't have the urgency now that they did before landing Nolasco and Hughes. They remain linked to Bronson Arroyo and Mike Pelfrey; my particular case of Sid Hartman Disease — the irrational wish to bring back former stars — is focused at this point on Johan Santana, whose shoulder rehab has reportedly progressed to playing catch at 90 feet on flat ground. If they do sign a pitcher, I doubt it will happen before the Rule 5 draft, which is pretty much the final act of the Winter Meetings. Trades? Unlikely. Ryan's said that he's more focused on free agency than on trades as a means to boost the 2014 team, because free agents don't cost players. (And, unsaid but implied, he's got more money to spend than trade chips to cash in.) The one real area of surplus he might have dealt from, second base, got dented with the news of Eddie Rosario's positive PED test. But ... it's certainly possible that the Twins will create that roster space cited above by peddling somebody (most likely a bullpen arm) for a prospect who doesn't need rostering. Twins he'll take number 45 off Scott Ullger's back. Phil Hughes' contract was finalized Thursday, which meant that the Twins had to clear room on the 40-man roster. The move: Liam Hendriks was designated for assignment. It seemed the obvious move to me; I had predicted it Monday. But my Twitter feed had a brief eruption from people -- notably Twins prospect guru Seth Stohs -- unhappy that Hendriks was targeted. Here's the thing, though: Hendriks simply hasn't been good at major league baseball. Thirty MLB games, 28 starts, 156 innings -- and a 2-13 record with a 6.06 ERA. Even now, Hendriks hasn't gotten to 30 starts. I think it's possible that the Aussie will eventually emerge as a competent back-of-the rotation starter. But that's the ceiling: A fourth or fifth guy. And the Twins have other arms who have come closer to achieving that status than Hendriks has -- Vance Worley, Scott Diamond, Sam Deduno, Andrew Albers. In that crowd, Hendriks was surplus inventory. Mike Bernadino of the Pioneer Press figured Hendriks' future might be in the bullpen. Well, again, the Twins have no shortage of arms for that role. Hendriks might be a good long man, but the Twins have Anthony Swarzak already. The Twins have 40 on the roster. If they're to play in the Rule 5 draft next week, and they almost always do, they'll need to clear another player off the deck. It became obvious Tuesday that, while the Twins may have gotten the deals they wanted in the starting pitching field of free agency, they were missing out on the catchers. A.J. Pierzynski, whose proposed return was welcomed by the sentimentalists in Twins Territory, opted instead to sign with the Boston Red Sox. Jarrod Saltalamacchia, the Red Sox' No. 1 catcher last year and another reputed Minnesota target, moved on to his hometown (more or less) Miami Marlins on a three-year deal. 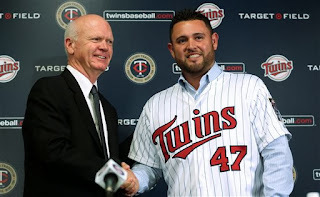 Which left Twins general manager Terry Ryan, during the Tuesday Ricky Nolasco presser, gamely declaring that the Twins are willing to go with Josmil Pinto as the No. 1 catcher. Willing, perhaps, but not quite eager. This isn't the Twins after the 2003 season trading away Pierzynski to make room for Mauer. They wanted an established catcher to buy time to further marinate Pinto in the intricacies of catching. But I infer from the apparent insistence on a short-term deal that the Twins believe Pinto can indeed become a capable defensive catcher. They don't want to block Pinto. It's still early in the offseason. The Twins might still land another receiver. But I doubt they're eager to invest in the likes of John Buck, J.P. Arencibia or Kurt Suzuki. And I'm not particularly eager to see them in Twins uniforms. Francisco Liriano, Corey Koskie and Jack Morris. The Twins are investing at least $73 million in a pair of free agent pitchers. That's a considerable amount of money being sunk into a high attrition rate. Ricky Nolasco, now officially a Minnesota Twin, is a soon-to-be 31-year-old — birthday in the middle of the month — with more then 1,300 major league innings on his resume. Major league pitching is unnatural. The human arm is not engineered to hurl such a projectile that many times with that much force. To pitch is to damage the arm. This is why four-year contracts for veteran pitchers are, as a rule, financial madness. Nolasco got four years, with an option for a fifth year. Phil Hughes is younger (27, turns 28 in June) but with a lesser durability history. His three-year contract, not yet official, is also risky business. In the abstract, these contracts look like mistakes. In the reality of the Twins, they are necessary overpays — and even if the commitments prove regrettable, they are unlikely to actually harm the organization. Nolasco's contract ($49 million guaranteed) and Hughes' ($24 million) puts the current projected 2014 payroll somewhere around $83 million. That leaves plenty of room — more than $15 million — in the 2014 budget. After next season such veterans as Josh Willingham ($7 million), Kevin Correia ($5.5 million) and Ryan Doumit ($3.5 million) come off the payroll, which figures to open lineup spots for the touted farm system to fill cheaply. The burden of these free agent deals is only a problem if it keeps the Twins from adding or retaining more valuable talent. That seems unlikely. There's still room in the budget now, and both contracts will expire before the Miguel Sano-Byron Buxton-Oswaldo Arcia-Josmil Pinto-Alex Meyer etc. wave of talent reaches free agency. Nolasco and Hughes are, to be sure, nobody's idea of aces. Drop Nolasco on the Detroit roster, and he'd be surplus inventory. For the Twins, he's likely their Opening Day starter. Overpaid, perhaps, but valuable — and neither a burden nor a roadblock. As I've noted in previous posts, Ricky Nolasco doesn't have an overpowering fastball (averages just over 90 mph, according to Baseball Info Systems), and he doesn't throw his fastball even half the time (44 percent fastballs in 2013, 45 percent in 2012, both figures according to BIS). But he does get swings-and-misses: 17 percent. That's a solid rate for a starter. The Red Sox' top three starters, for example: Jon Lester, 14 percent; John Lackey, 16 percent, Clay Buchholtz, 15 percent. Phil Hughes, on the other hand, does throw hard (average fastball exceeds 92 mph) and throws his fastball quite a bit (more than 60 percent of the time). He gets, or did in 2013, somewhat fewer swings and misses, 14 percent. Hughes and Andrew Albers really do pound the strike zone. Today is the deadline to offer contracts to arbitration-eligible players; those who are non-tendered become free agents. Also today, the Twins have a pair of free agent not-quite-signees in for physicials, the major hurdle in turning Ricky Nolasco and Phil Hughes into bona fide signees. The Twins as of this morning had 39 players on the 40-man roster, so they'll need to drop somebody to add both Nolasco and Hughes. Presumably the Twins will want to play in the Rule 5 draft at the Winter Meetings next week; that requires an open spot. If the rumors about adding a catcher and/or yet another pitcher are valid, still more spots will be needed. The convergence of the free agents and the tender deadline is coincidental, and the decisions shouldn't be connected — by which I mean, the Twins shouldn't nontender Brian Duensing merely to make room for a free agent. Dropping one of their three arbitration-eligible players (Duensing, Trevor Plouffe and Anthony Swarzak) should be based on their projected salary via arbitration (which will be a sizable raise for each) versus their value to the team. I expect the Twins to tender all three. There is room in the budget and roles on the squad for them. The one most at risk is probably Duensing, but I don't envision the Twins cutting him loose. Still, there are cuts ahead. The front office, I'm sure, knows who will be removed from the 40-man roster. My guesses: Liam Hendriks and Kris Johnson, with Chris Colabello also a real possibility. Eric Fryer, as I said a week or so ago, will probably remain on the roster unless and until a catcher is added. UPDATE: I was apparently a bit ahead of myself on the Hughes physical. A press conference is scheduled for Tuesday for the Nolasco signing. And the Twins indeed announced today that they were tendering contracts to Duensing, Plouffe and Swarzak. Phil Hughes's 2012 Topps card. Away back in the winter of 2007-08, when the Twins were shopping Johan Santana, Phil Hughes was a hot Yankee prospect and the arm connected to a potential trade. It never happened, of course. But now, unless something unforeseen jams up the process (like a physical that discovers he has cancer or something), Hughes is about to become a Twin after all. The Yankees, weary of his tendency to allow homers, made no effort to retain the 27-year-old righty and 2010 All-Star as a free agent, and he hopped onto the Twins' three-year, $24 million offer. One thing I like about the signing: Hughes is a significantly different pitcher than Ricky Nolasco, who agreed to join Minnesota last week. Nolasco relies on his breaking balls and gets a conventional set of results; Hughes is more a power arm and is one of the most pronounced fly ball pitchers around. The Twins rotation now figures to have a more diverse set of skills and approaches, rather than being a steady parade of sinker-slider guys. In 2013, Hughes faced 642 batters. They hit 144 ground balls (22.4 percent), 106 line drives (16.5 percent) and 217 fly balls (33.8 percent). In 2012, in which Hughes was more effective, he faced 815 batters, who produced 192 ground balls (23.5 percent), 118 line drives (14.4 percent) and 282 fly balls (34.6 percent). Hughes' average fastball velocity is listed at 92.4 mph in 2013, 92.1 in 2012. In the season just finished, he used the fastball on 62 percent of his pitches, with slider an emphatic second choice (24 percent). He also threw a curve (9 percent), a change (5 percent) and a very occasional splitter (less than 1 percent). His mix in 2012 was, according to the Handbooks, a bit different: 65 percent fastballs, 18 percent curves, 10 percent changes, 4 percent sliders and 2 percent cutters. I don't know if there was an actual change in the mix or if this is an issue with pitch identification. The obvious issue for Hughes with the Yankees was his home-road split. Last season he was 1-10 with a 6.32 ERA in Yankee Stadium, 3-4, 3.88 on the road. He gave up 17 homers in 78.1 innings in the Bronx, 1.95 homers per nine innings. Presumably there were several Yankee Stadium homers that won't reach the right field seats, or even the wall, in Target Field. But if the Twins continue to parade Oswaldo Arcia and Ryan Doumit in right field on a regular basis, there's no guarantee those balls are going to be caught, either. Joe Jackson -- "Shoeless Joe" -- was a feared hitter in his day. He was also notoriously illiterate. One day as Jackson stood at the plate, a leatherlunged fan behind third base kept yelling at him: "Hey Joe! Spell cat!" Jackson paid the heckler no heed, focusing on the pitcher. He got an offering he liked, lined it into the gap, sprinted around the bases and slid into third. Then Jackson scanned the seats until he had located his tormentor. He spit tobacco juice in his direction and yelled back, "Hey, (expletive)! Spell triple!"